Does exactly what it's supposed to, covers the bike from the elements. Excellent product, lightweight, easy to put on bike, well made, eyelets at front wheel location for lock, elasticated round bottom makes it a good fit around bike. I expected much lower quality, according to price. Pleasantly surprised. 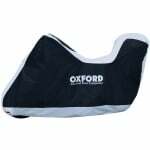 Lightweight good value for money does the job. Excellent quality for good value . Good cover does what it promises, little on the light weight side if anything. I've now owned 4 of these covers. I only ever give them 4 Stars though as they don't keep your bike completely dry in heavy rain. They water does seep through eventually, especially if the cover makes contact with your bike. However for the cheap price it's still a good wee cover. Which size for my Yamaha FZ1? Previous customer feedback would suggest that a "Scooter with top box" cover would be the best size for your model. You would need to measure to the top of the mirrors unless they can be folded down/in. Hi, Could you please tell me which size cover I would need for a Kawasaki ER6-N? Hi, Which size would suit yamaha xj6 diversion s please? Previous customer feedback would suggest that a medium cover would be suitable. Which would be the best size for a GSX650F with a large top box please? Previous customer feedback would suggest that a large with top box cover would be the best size for your model. If in doubt the dimensions for the covers are shown on the website. Hi Can you confirm what size I'll need for a new Honda Forza 300? The scooter cover appears to be too short in length? We have no previous customer feedback on this bike, but we would suggest the large cover for your Forza. Does the cover have slots at the wheels that you can use when using a chain to secure the bike? There are slots at the front of the cover to allow for a chain. Which size for a 1999 Kawasaki ZRX1100 please? What size of cover for a 1988 Honda C90 with Rickman topbox, please? Thank you. Previous customer feedback would suggest that the scooter with top box cover would fit your Honda. What size cover do you recommend for a triumph tiger 800 please? Previous customer feedback would suggest that a medium with top box cover would be the best size for your model. If in doubt the dimensions for the covers are shown on the website. What size do you recommend for a KTM RC8 Medium or Large? Previous customer feedback would suggest that a large size would be the best fit. We would suggest the medium size and the cover is waterproof. I have a Yamaha MT07, which size cover would I need please? Previous customer feed back would suggest that the medium size cover is the best fit for your Yamaha. Which size would fit a Honda NC750X with top box attached? Previous customer feedback would suggest that the large with top box cover would be the best fit for your Honda. What size should I get for a 2005 Honda CB600F hornet? Previous customer feedback would suggest that the medium would be suitable for your Honda. I have a lexmoto FMR 125, what would be the best product to use for that type of bike? 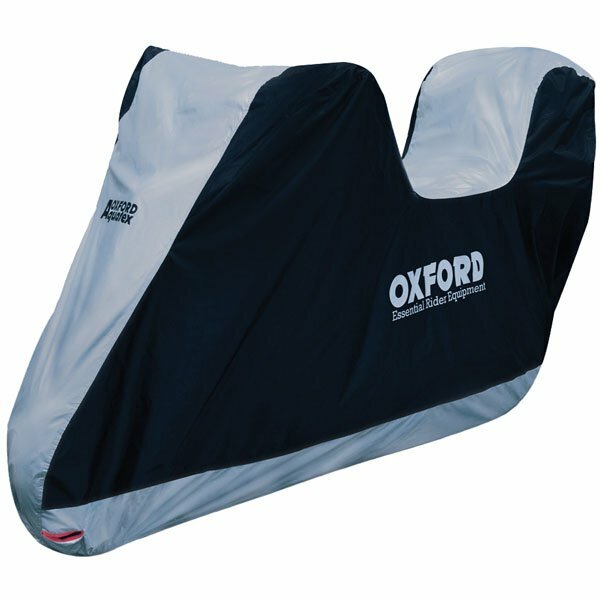 The 'Scooter' size cover should be suitable for the FMR125. hi, what size recommendation for a Honda CBR650F 2017 model please. What size cover do you recommend for a 1972 BMW R60/5 with tall windscreen and topbox? Previous feedback would suggest that the large with top box cover would be suitable for your BMW. What cover would you recommend for a Triumph Tiger 1050 S with top box. Hi.. What size would you suggest for a Kawasaki Z750 with small tail rack fitted? Which size do you recommend for a 1999 R6? The Medium should be big enough. Please can you advise me the correct size for a 2009 Suzuki DL650 V-Strom? We would suggest the large cover for your V-Strom. Previous customer feedback would suggest the large cover would be the best fit for your Fazer. Which size for CBR600 RR 2011? The medium should be adequate. What cover size do I need for Honda PCX 125 ? Customer feedback suggests that the 'Scooter' size should be sufficient. Medium or Large for CBF600SA with Topbox? Hi, what size will i need for honda blackbird with rack for top box. Hi , which size cover would you recommend for the Kawasaki Z800? We would recommend the medium cover for your Z800,but please compare the dimensions of your bike to the cover dimensions listed just to double check. We would recommend the medium cover for your Ducati Scrambler. 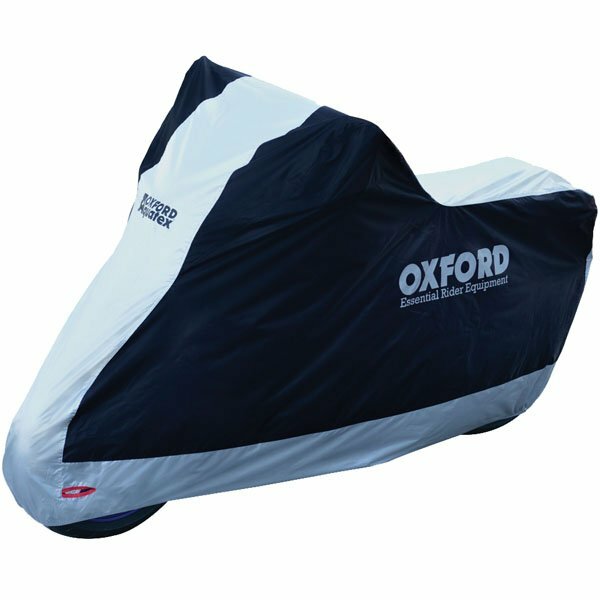 We would suggest the extra large size cover for a BMW R1200GS. A motorcycle exhaust and engine components can be far hotter than 150 degrees directly after use, so the cover should not be used until the motorcycle has cooled down. I would recommend the XL with top box for your bike. Which size will I need for a Kawasaki VN800? Unfortunately the covers are not supplied with a specific model application list, so we do tend to rely more on customer feedback. Although we do not have a review from a VN800 owner, I would have thought that perhaps either the large or extra large would be needed to accommodate the length of the bike. Will size "Scooter with top box" be ok for my Honda S-Wing with the box? Please compare the measurements of your bike to the measurements in the dimensions table to select the appropriate size for your bike as this will be the most accurate way to determine the correct cover.